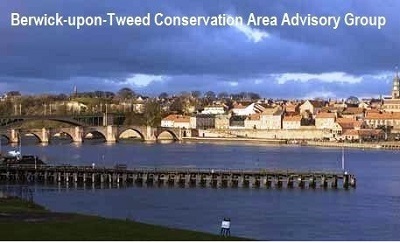 The Berwick-upon-Tweed Conservation Area Advisory Group (CAAG) was created in 1999 to oversee a range of partnership projects in the borough’s conservation areas. It has delivered a number of heritage regeneration schemes since then through a combined grant programme using English Heritage, County and Borough Council funds. This includes repairs to individual buildings, streetscape enhancements and the further study of the town’s unique heritage. The group has evolved over time to meet the demands and pressures placed on the historic environment and now exclusively deal with the Berwick, Tweedmouth and Spittal conservation areas as part of a much larger focus on a Regeneration Strategy for the town. Ever keen to promote the significance and value of these neighbouring conservation areas, CAAG is made up of passionate individuals from across the three communities that all care deeply about their unique heritage. With representatives from resident’s associations, Berwick Civic Society, local Development Trust, Chamber of Trade, elected Members, Heritage Champions and officers from the field of conservation and archaeology, the group feeds directly into the planning process. As an independent group from across the public and private sector it is able to offer: conservation comments on planning applications; advice and comment on new heritage policy and guidance; input to public realm schemes; as well as direct involvement with the area’s Character Appraisals and Management Strategies. With so much enthusiasm and common interest there are often lively exchanges and debates about conservation matters. The group however, has developed several techniques for coping with differences of opinion, as it is important to convey a consistent and combined “CAAG view” when offering a formal response. Following a group training day it devised an agreed checklist for assessing developments in conservation areas that includes looking closely at setting and context, analysing the layout and density of new developments as well as looking at height, scale and matters of detail. This has proved to be a useful method that enables the group to focus on design related matters and has evolved to include architect’s presentations to the group. Before inviting architects and agents to convey their schemes, CAAG undertook a consultation exercise and drew up an agreed protocol to ensure that both sides would benefit from these early stage discussions. It is working well so far and all agree that it is adding value to CAAG’s understanding and final comments to the borough planners. The combined expertise and knowledge also results in small sub groups forming to look at national and regional consultation documents like the recently published English Heritage criteria – History in the View, to more site specific briefs as part of the Berwick Regeneration Strategy. The Berwick CAAG is often called an “exemplar” and is fiercely defended by its members who have increased the number of times it meets during a calendar year. It has consistently met for the past ten years and is recognised as a credible and useful resource that works effectively in partnership with the Council in protecting and enhancing the town’s unique heritage assets. The group will hold its ten year anniversary and last meeting under the current Berwick Borough banner on the 31st March 2009. However, it has no intention of dissolving and giving up its important work and will continue into the new unitary authority and hopefully through another decade of conservation management and partnership working.